Mexico, not to overstate the obvious, is a big country, one possessed of a rich and diverse culinary history to match its size. 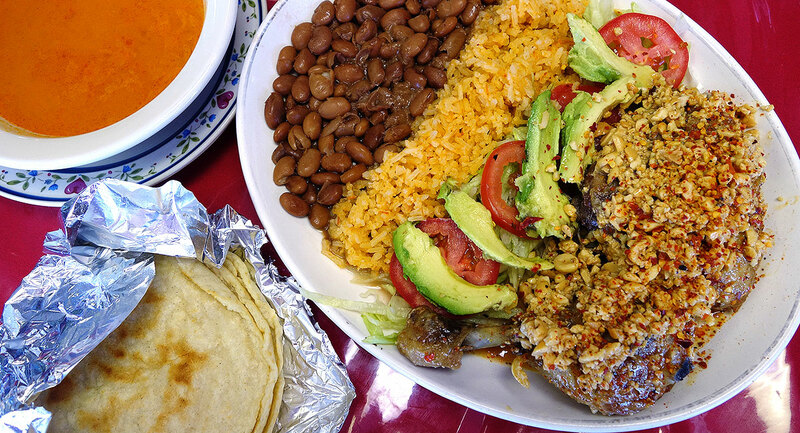 As such, when you’re accustomed to the Sonoran-influenced Arizona Mex that dominates in Phoenix, a Pueblan dish — like the Pollo en Chiltepín con Cacahuate at Restaurant Huauchinango — can be a striking and delicious departure from the norm. Huauchinango is one of the red-headed stepchildren of Phoenix’s Mexican scene, a strip mall Pueblan restaurant, named after its owner’s hometown, that’s easy to miss among the city’s ubiquitous Sonoran taco joints. It’s here that owner and chef Alejandro Bonilla offers a style of cuisine difficult to find in the Valley. To be fair, Phoenix and Puebla aren’t entirely unacquainted. But while dishes from other regions will occasionally sneak their way into the local consciousness, restaurants like Huauchinango — which has been quietly plugging away for a decade, preparing moles, molotes, and tlacoyos amidst a sea of burros and beans — are the exception rather than the norm. The uniqueness of the menu, while a delight, shouldn’t come as a surprise. The city of Huauchinango is as far from Hermosillo, the capital of Sonora, as Phoenix is from Portland, Oregon. Nonetheless, when a plate of pan-fried chicken smothered with a sauce of chunky toasted peanuts and spiked with fiery crushed chiltepín goes walking by, in this city, it’s a head-turner. The chiltepín itself, however, is no stranger to Arizona. Also known as chile tepin, chiltepín is a tiny little firecracker of a chile pepper, delivering a sharp, fruity sting before quickly fading. More remarkable than its potency is that it packs this heat into a diminutive pea-sized frame. It’s also a local product, native to Arizona, where it has grown, both wild and cultivated, for centuries. It’s chiltepín that delivers the pop in Pollo en Chiltepín, a common Pueblan dish. Huauchinango’s version starts with a chicken leg quarter that’s first roasted, and then deep fried for a few minutes to produce a crispy skin. While the chicken cooks, Bonilla starts a pan sauce with chicken stock, lightly crushed peanuts (the “cacahuate” in the dish’s name), a healthy sprinkling of chiltepín, and a little bit of oil, which slowly crisps the peanuts as the sauce cooks. The chicken comes out of the fryer and goes into the pan, where it’s basted with the bubbling sauce, while fresh masa is flattened into tortillas and tossed on the griddle to accompany. After the chicken and sauce have had a chance to marry, they’re dusted with a little more dried chiltepín, transferred to a plate along with rice, pinto beans, and cold vegetables like shredded lettuce and sliced tomato and avocado, and served along with the fresh tortillas and a small bowl of soup. Once it hits the table, the chicken needs a sprinkling of salt — to the diner’s taste — to wake it up, and when that happens, the flavors blossom. In essence, it’s a very gently flavored dish, with little more than the earthy peanuts and warm chile heat to play off its simple, natural chicken flavor, which is its heart and soul. But these rustic charms are greatly enhanced by the outstanding texture that results when crisply fried chicken skin meets crunchy toasted peanuts. Fresh from the kitchen, you can almost feel it still sizzling and popping as you dig in. 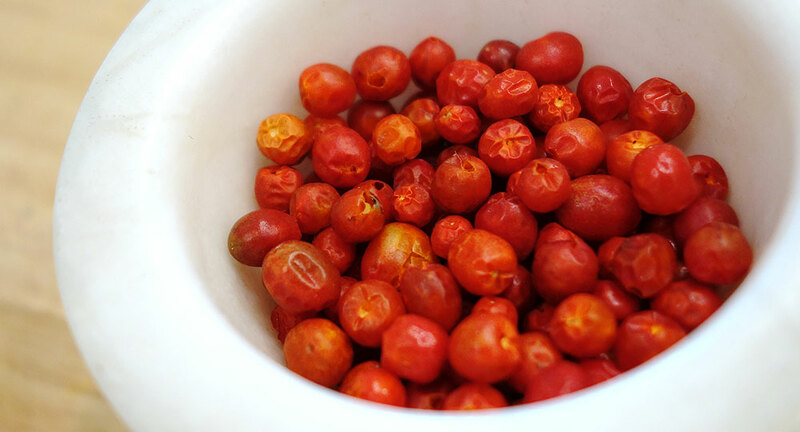 Their standard preparation is fairly light on the chile, and the chiltepín provides more of a warm, smoky hum than a fiery blast, but the kitchen is all too happy to honor requests to make it spicier, and sometimes even has some crushed chiltepín toasted in oil on hand to serve as a condiment. The other components round out a perfect meal. Beans and rice provide that simple, starchy baseline, while the sliced vegetables and creamy avocado provide a cool counterpoint. The tortillas are lovely, thick and chewy and still piping hot from the griddle. 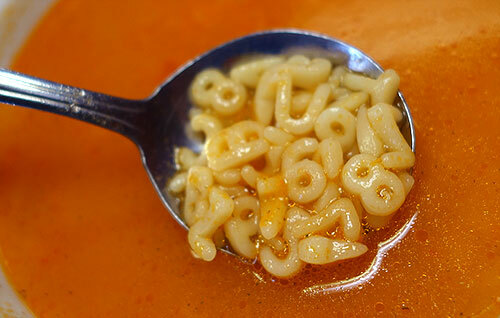 And to further bolster this ode to chicken’s natural meatiness, it comes with a bowl of rich chicken broth, punctuated with tomato and, of all things, alphabet pasta. Intentional or not, Huauchinango manages to deliver not only a delicious dish, but a chuckle as well. 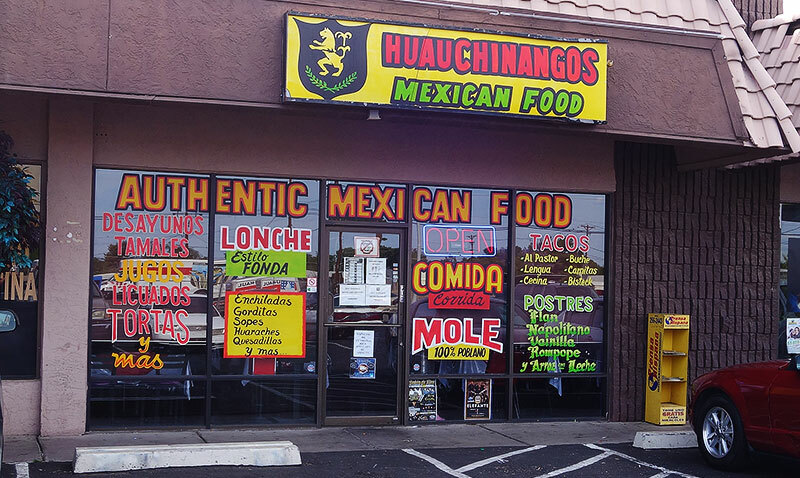 Restaurant Huauchinango is located at 1620 W. University Drive, in Mesa, Arizona 85201. If you pull into the strip mall on the NW corner of University and Longmore, you can’t miss it, but you can call them at 480.835.2054 if you have any trouble. It’s as casual as casual can be, a homey and colorful little joint where you can and should also try the enmoladas, doused with their from-scratch mole Poblano, crisp gorditas, and pillowy soft fried quesadillas that will be a revelation to anybody who’s accustomed to the Americanized version. In addition, they’ll shortly be opening a little stand in the corner to sell raspados and other frosty summertime treats. This entry was tagged chicken, chiles, chiltepín, Mexican, peanuts, Pueblan. Bookmark the permalink.